In the increasingly informal society of the early 2000s, in which many social barriers have broken down, it is arresting to read of the rigid code of manners that once determined who was, and who was not, eligible to be received at court, and who was, or was not, therefore part of "Good Society." In Europe, by the seventeenth century, wearing the correct dress on this occasion was quite as important as having the right background. Within a royal household, officers were appointed to supervise aspects of royal life. The officer, often called a lord chamberlain, who had charge of public and ceremonial events, would usually oversee the regulation of dress and matters of etiquette. 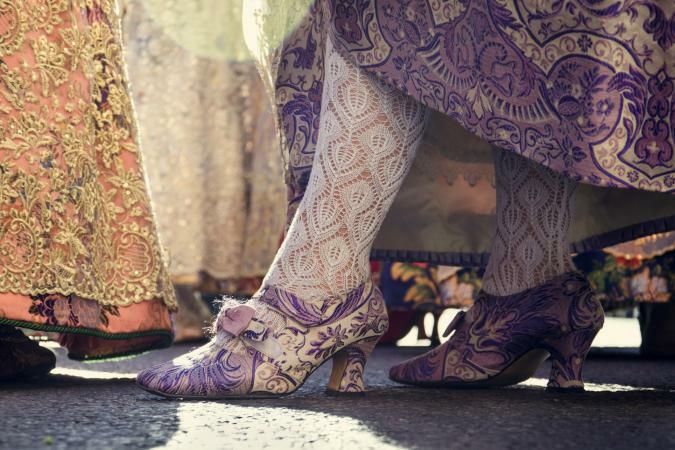 By the nineteenth century, as the categories of people eligible for court presentation increased, and the styles of court dress became ever more various and complex, all earlier printed dress instructions were drawn together and published as formal regulations. In Great Britain, "Dress Worn at Court," first published in 1882, was updated and reissued at about five-yearly intervals until 1937. Subsequently, hand-lists have been provided to specific individuals within the Royal Household, Foreign Office, Parliament, and Law Courts where the wearing of court dress may survive. Until the late eighteenth century, in many European countries, many offices and titles remained as the personal gift of the monarch and members of his family. Both politicians and merchants found it essential to demonstrate to potential supporters that they enjoyed the favor of the court, to see their projects succeed. Even as the political importance of the court began to wane, there was always social advantage to be gained and special efforts continued to be made within the royal household to regulate the numbers and social standing of those attending. It was necessary for any new aspiring attendee to locate someone who had already been presented, to serve as his or her sponsor. In seventeenth-century France, a set of rules called "les honneurs de la cour" were drawn up. A French lady craving admittance had to prove a title of nobility extending back to 1400. Since the eighteenth century, there is evidence that this system could be abused: court officials could be bribed to gain admittance, the services of a sponsor could be bought, and sometimes the monarch himself would override the rules allowing a person of humble birth to attend as "une faveur de choix." The Spanish court was the earliest to actively promote a distinctive court dress from the sixteenth century. All courtiers, state officials, and those attending court had to wear a doublet and close-fitting knee breeches, made of silk or wool in a somber color, worn with the stiff "gorilla" collar of white linen. Eventually, the practice was adopted throughout the Spanish Empire, in Austria, and certain Catholic German states. Lord and ladies, 17th Century France. By the mid-seventeenth century, Louis XIV was concerned with promoting himself, the prestige of the French court, French fashion, and culture. In 1661 he devised a system whereby fifty of his closest friends and supporters were allocated by special warrant a specific court dress. 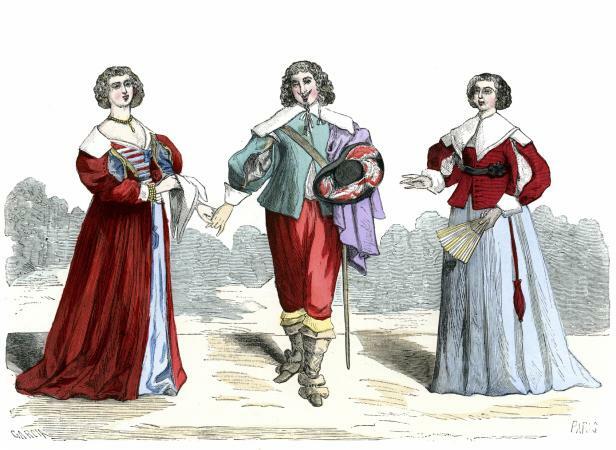 It was composed of a blue coat called a "justaucorps a brevet," lined with red and trimmed with gold and silver galloon (braided trimming with scalloped edges), to a degree not allowed within earlier sumptuary legislation. The outfit was completed with a waistcoat, knee breeches, red-heeled shoes, and a sword. When the dauphin reached his majority, a brown coat similarly embellished was devised as the regulation dress for his household. In about 1670, Louis XIV, perhaps with his brother, Philippe, duc d'Orleans and his wife, established the "grand habit" as a court dress for women. This dress had a stiff-boned bodice with a low, round neckline and cap sleeves trimmed with tiers of ruffles called "engageantes." The skirt was cut full, and pulled back to reveal the petticoat worn beneath. This was often richly decorated. For their first presentation to the French king the "grand habit" had to be black. Subsequently, colored dresses could be worn. By about 1730 the petticoat was worn supported on large side hoops. A train replaced the skirt. French court dress was adopted with small variations as court dress throughout Europe. By 1700 it had even become the regulation dress at the Spanish court for all but the most formal occasions. In Great Britain the "grand habit" or "stiff bodied gown" was worn by members of the royal family and their immediate circle for royal weddings and coronations. However, by about 1700, the mantua was the customary dress worn by ladies attending court. It had an unboned bodice and full skirt. The neckline was cut square, and the bodice was closed in front with a separate stomacher. The elbow-length sleeves were finished with tiers of ruffles. The skirt was lifted back to reveal a petticoat worn beneath and by about 1750 served as little more than a train. By 1730 the petticoat was supported with large side hoops. Ladies attending court in 1750 were generally wearing ostrich feathers as a hair ornament, and in 1762 Horace Walpole notes that they were considered "de rigueur." Lace lappets had also emerged as the enduring trimming. Men's court dress in Great Britain was also simpler than its French counterpart, comprising a coat, waistcoat, and knee breeches, often made of fine silks and velvet, and frequently lavishly embellished with embroidery. The "grand habit" saw its demise in 1789 with the French Revolution. However, by 1804 a new official dress had been devised by Jean-Baptiste Isabey for French government officials, as well as Napoleon, his family, and inner circle. For ladies a court train alone was retained, worn over fashionable evening dress. The second half of the eighteenth century had seen many European courts beginning to devise special uniform liveries to be worn by members of the royal family and royal circle. In France, Louis XV established a green and gold costume as "uniforme des petits chateaux." In 1734 Frederick, Prince of Wales in Great Britain, had devised a blue and buff uniform. His son George III in 1778 was responsible for the introduction of the Windsor uniform with its blue coat and distinctive red facings. It was also in 1778 that Gustavus III of Sweden put together a comprehensive order of court uniforms not only for his family and household, but also encompassing government officials, military officers, legal officials, and even university staff and students. They were of a consciously archaic style having its origin in seventeenth-century fashion, a period associated with Swedish greatness. Small variations in materials and ornament served to differentiate classes of officials. A court dress was also devised for Swedish ladies on similar lines. It was generally black and had a low round neckline trimmed with lace, and distinctive white puffed sleeves trimmed with a lattice of black ribbon. Isabey's new system of official dress in France included uniforms for almost every office. By 1815 a similar program had been devised in Great Britain, the uniforms based on a pattern used by the French Army. This had a blue coat, embroidered with gold, worn with white knee breeches, silk stockings, flat pumps, a "chapeau bras" and a court sword. As the century progressed, more uniforms were added as new classes of officials were drawn into the system. Typically a uniform would be fashionable at the date of its introduction, but was rarely updated as the years passed. The embroidery would include motifs associated with the nation concerned or those, such as laurel or oak, traditionally associated with valor and steadfastness. 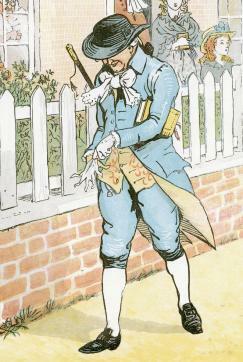 In early nineteenth-century Britain, the cloth court dress, worn by men for whom no uniform was prescribed, maintains the link with eighteenth-century custom. This was replaced in 1869 by "Velvet Court Dress" cut on very similar lines. While a more fashionable option was devised in the 1890s, this style of dress may still be seen worn in the early 2000s. The French Revolution had comparatively little impact on women's court dress in Great Britain. The mantua continued to be worn, supported with an immense court hoop until 1820 when George IV suggested it should be abandoned. After this date court trains were worn over fashionable evening dress, with ostrich feather headdresses and lace lappets. By 1867 lace lappets were proving increasingly difficult to obtain, and the lord chamberlain permitted the wearing of two silk net streamers instead. In 1912, the lord chamberlain established that the streamers should be no more than forty-five inches long. The great profusion of ostrich feathers included in court headdresses of the early nineteenth century had been reduced to two or three by mid century. In the dress regulations published in 1912, it is noted that there should be three feathers worn after the manner of the Prince of Wales's crest toward the left side of the head. In 1922 the lord chamberlain ordained that the court train was restricted to eighteen inches from the heels of the wearer. The color of ladies' court dress was not prescribed, but it became the convention that the dresses were of a pale hue, particularly for those being presented to the monarch for the first time. Special permission had to be sought to wear black court dress, should the lady being presented be in mourning. The nineteenth century saw the development in many nations of a distinctive court dress. Some countries such as Russia and Greece followed the Swedish lead and introduced elements of traditional dress into their design. Other countries, as diverse as Venezuela, Norway, and Japan, selected a system of uniforms based on European military patterns. Tailors, in London, Berlin, and Rome in particular, provided a comprehensive service designing as well as manufacturing the garments. Many of the European courts, where the wearing of court dress had been so enthusiastically promoted, were swept away during World War I. The British court proved more resilient, and in London court dress continued to be worn until the outbreak of World War II in 1939. But Britain emerged from this conflict very changed. The social mores that had underpinned the court system had broken down. Even though court presentation continued until 1958, a special dress was not prescribed. Court dress is rarely worn in the early 2000s. In most European countries a few particular officials working in the foreign office, parliament, and the law courts may be required to wear it on occasion. In Sweden, Denmark, and Norway since 1988 the wearing of a court dress within the royal family and its immediate circle has been reintroduced for the grandest ceremonial occasions. The new Swedish pattern is based in the eighteenth-century Swedish tradition. The styles in Norway and Denmark are modern creations. Arch, Nigel, and Marschner, Joanna. Splendour at Court: Dressing for Royal Occasions since 1700. London: Unwin Hyman, 1987. Delpierre, Madeleine. Uniformes civiles ceremonial circonstances. Paris: Ville de Paris, Musee de la Mode et du Costume, 1982.
de Marly, Diana. Louis XIV and Versailles. London: B. T. Bats-ford, Ltd.; New York: Holmes and Meier, 1987. Mansfield, Alan. Ceremonial Costume. London: Adam and Charles Black, 1980. Rangstrom, Lena, ed. Hovets Drakter. Stockholm: Livrustkammaren/Bra Bocker/Wiken, 1994. Ribiero, Aileen. Fashion in the French Revolution. London: B. T. Batsford, Ltd.; New York: Holmes and Meier, 1988. --. Dress in Eighteenth Century Europe 1715-1789. New Haven, Conn.: Yale University Press, 2002.